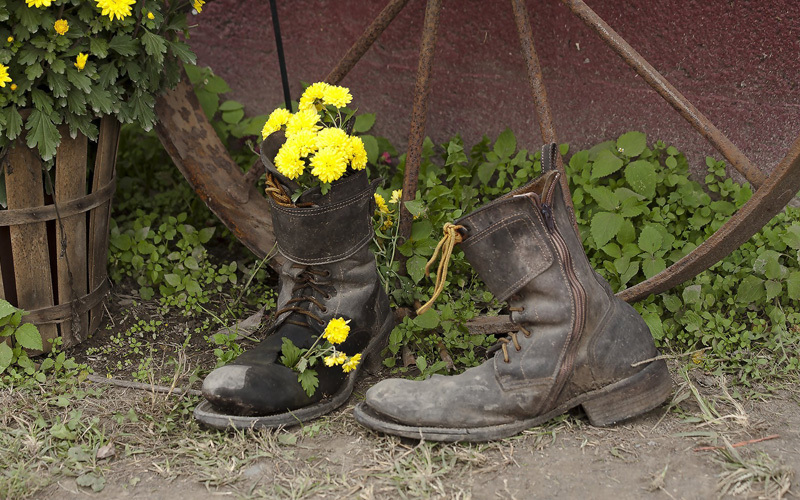 If a plant can grow anywhere, why not tuck it into an old boot? 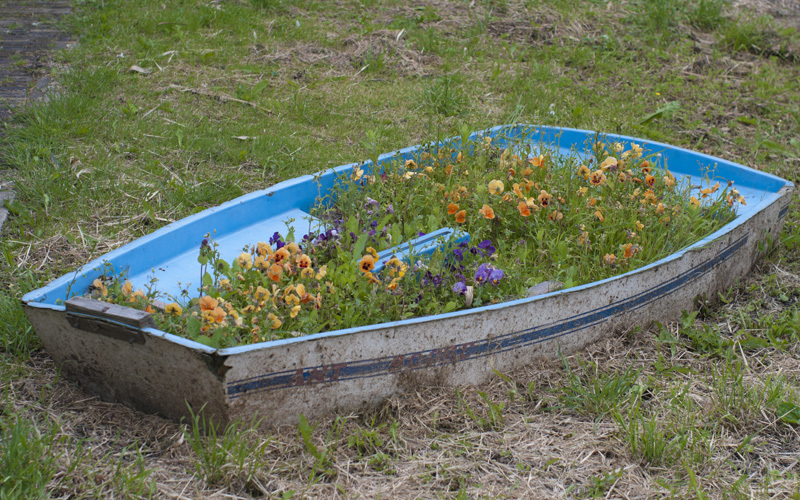 If that looks great — and it does — try filling a junked convertible with zinnias and daisies. Don’t forget the trunk! 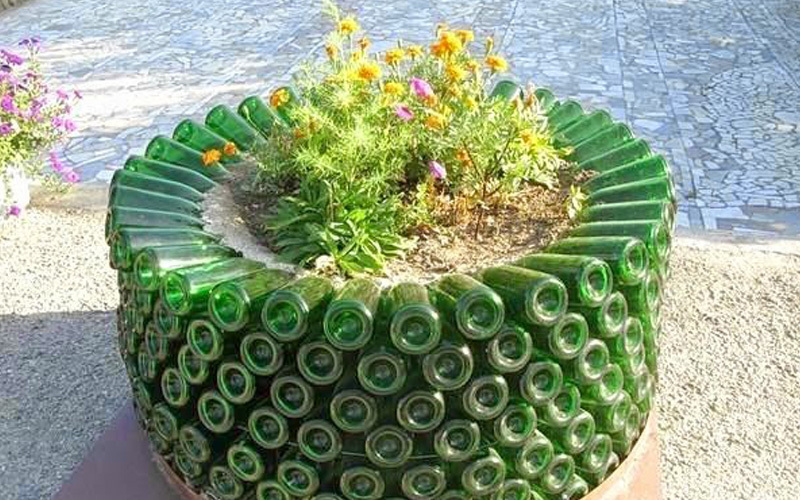 What follows are 20 ingenious ideas for rescuing unused household items and turning them into plant pots and container gardens. 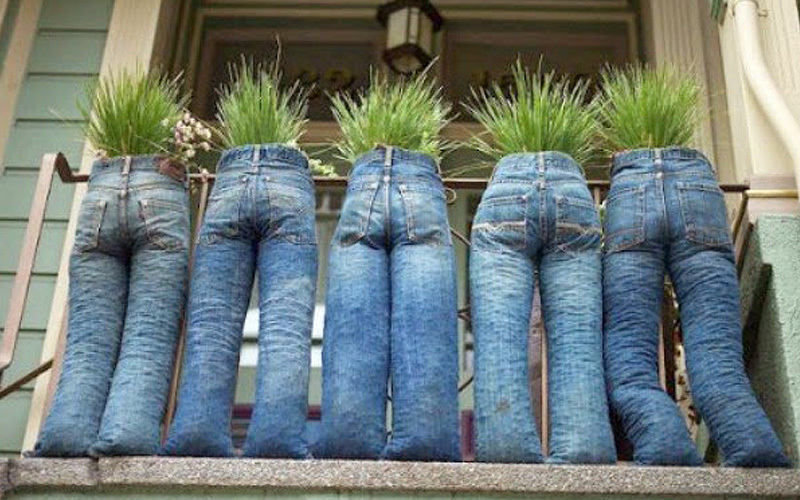 Spiky grasses sprout from the tops of five pairs of stuffed jeans. They lean against a balcony railing as if waiting to be invited inside. Blue jeans and soft green grasses make for a subtle color scheme in this humorous lineup that’s sure to get a chuckle from friends and neighbors. 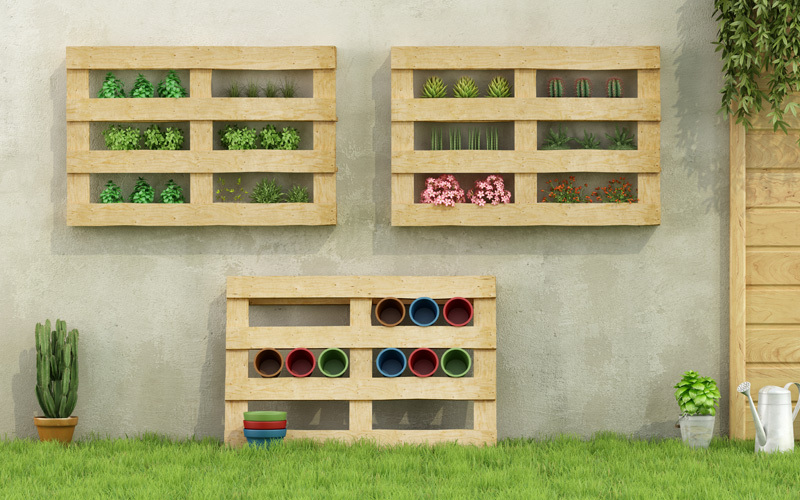 Wooden shelves with slats nailed across the frame create a safe place for dozens of small plants. 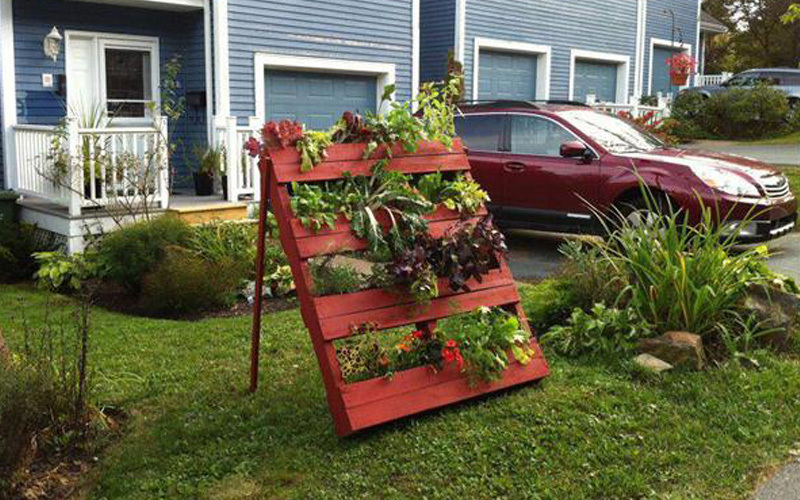 Two sets of shelves attached to the wall keep plants secure from the wind but open to sunlight. One leaning against the wall neatly stores empty pots. 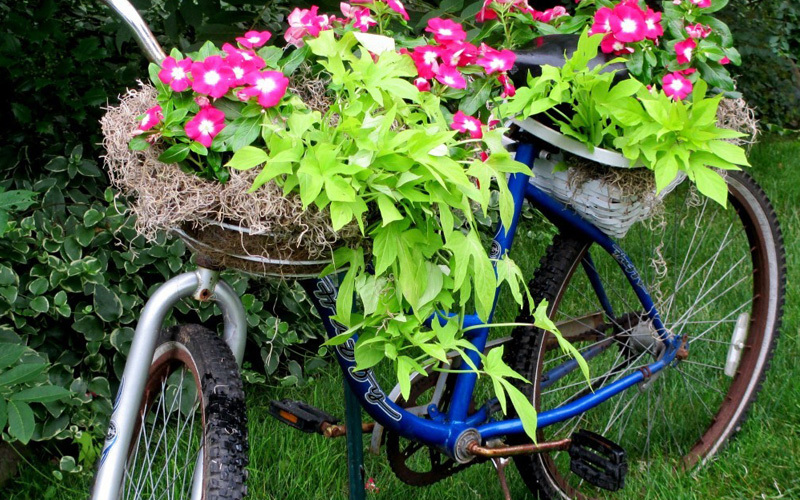 The basket of this blue bicycle is filled with pink flowers and trailing greens. Containers attached to the seat overflow with plants, replacing the rider that used to pedal the bike, which is now permanently parked on the grass. 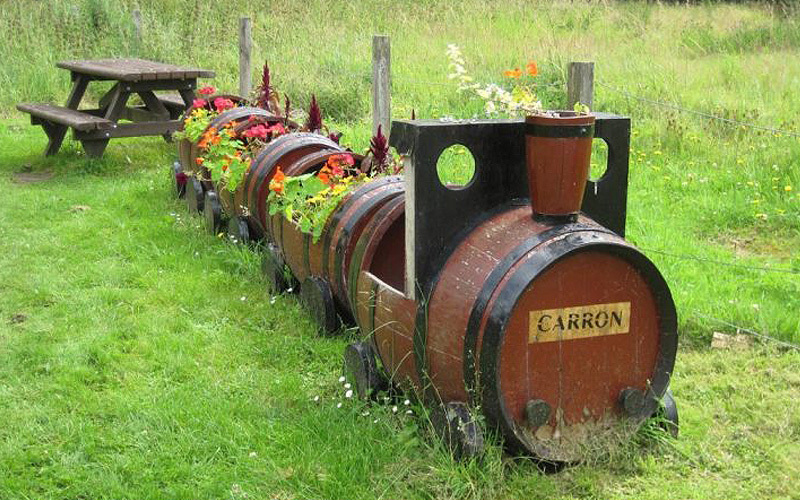 Ratty black tires are transformed into cheerful planters with layers of yellow, orange and green paint. They are hanging from chains looped into a window screen and planted with trailing flowers that spill over the sides, softening the edges. 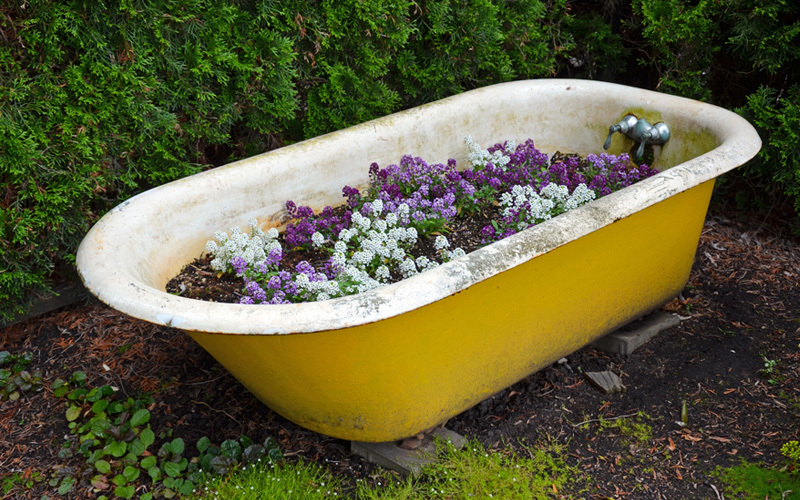 Coordinating troughs in yellow and orange complete the design, which hides a gray painted window. 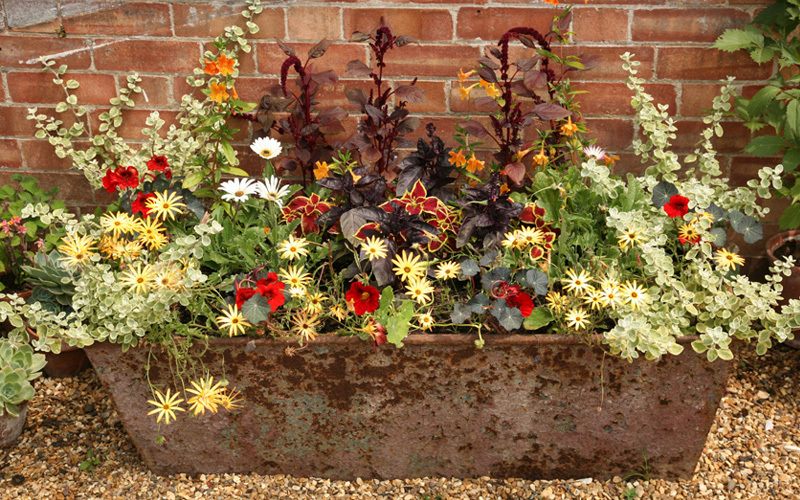 Old horns that have lost their shine make eye-catching planters when attached to a window box. 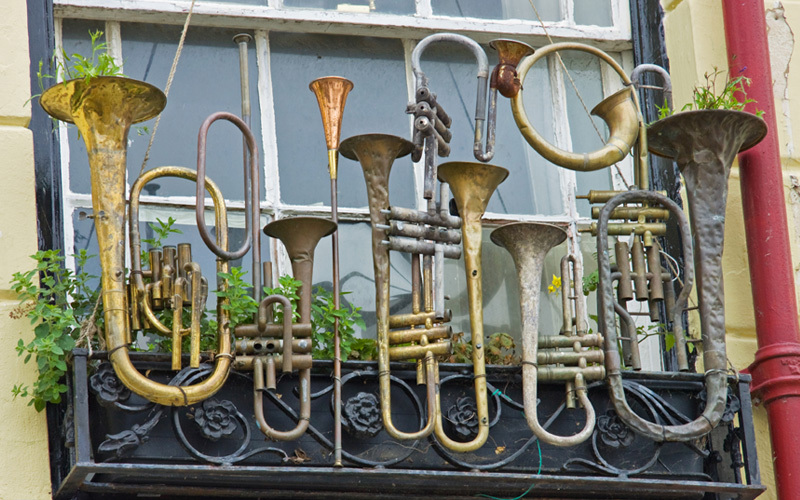 The looping tubular shapes steal the show as the plants barely emerge from the dented bells of the musical instruments. 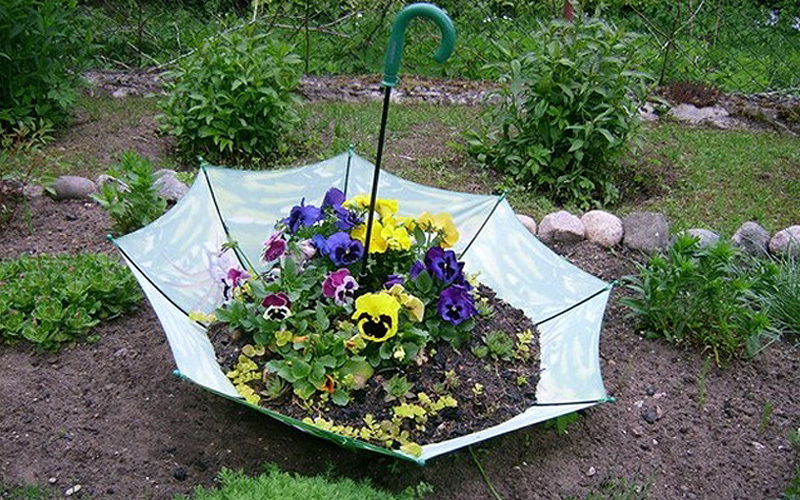 A white umbrella no longer useful as a shelter from the rain is put to use as a planter for blue, yellow, and purple pansies. The scalloped umbrella looks like a large white blossom, giving this clever container the appearance of a garden within a flower. 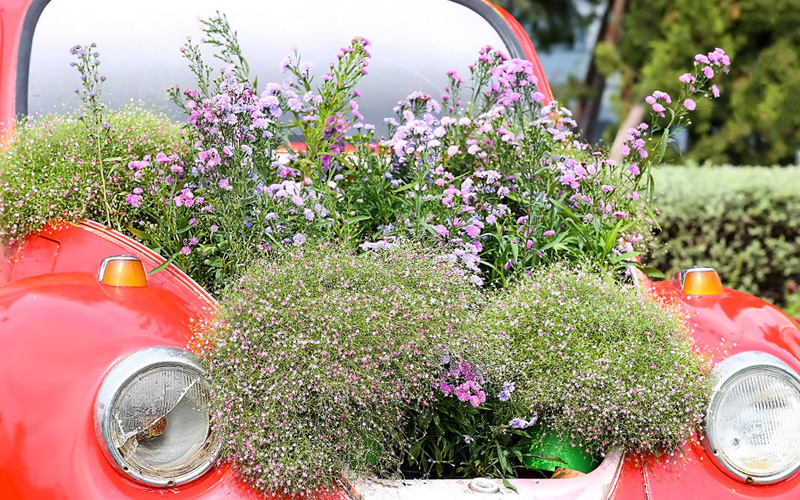 The front compartment of an old red Beetle is filled with purple flowering plants. This design harks back to the the painted flowers that adorned counterculture vehicles in the nineteen-sixties. No longer road-worthy, the little car still makes a big statement. This red convertible is filled with multicolored flowers in the front seat, back seat, and trunk. 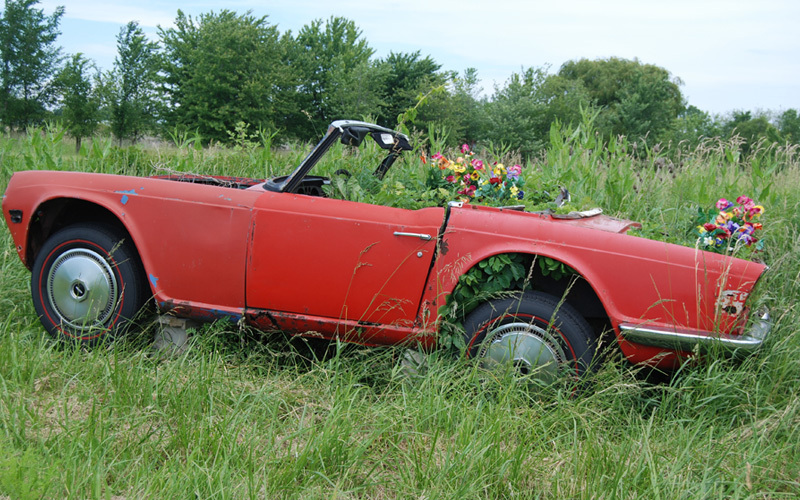 Plants are the car’s only occupants now that it has found a permanent parking place in a grassy field. 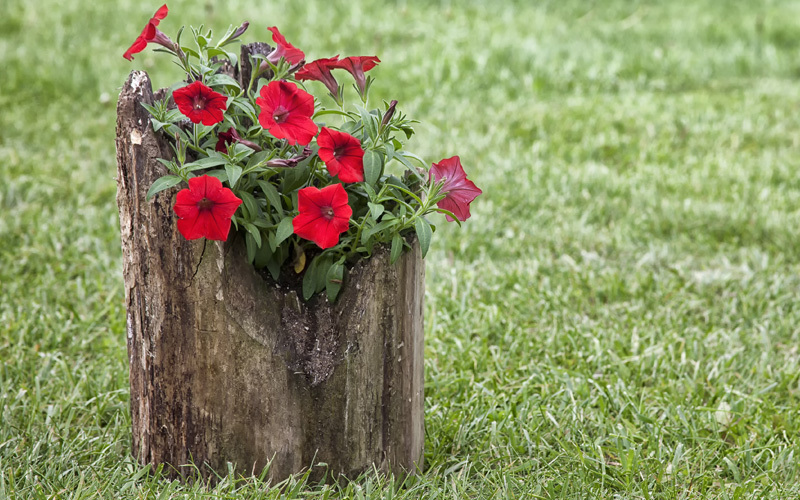 A weathered hollow log filled with potting mix makes a container for a plant with elegant red blossoms. The ragged edge and peeling bark make a beautiful contrast with the scarlet flowers that hover above the log. 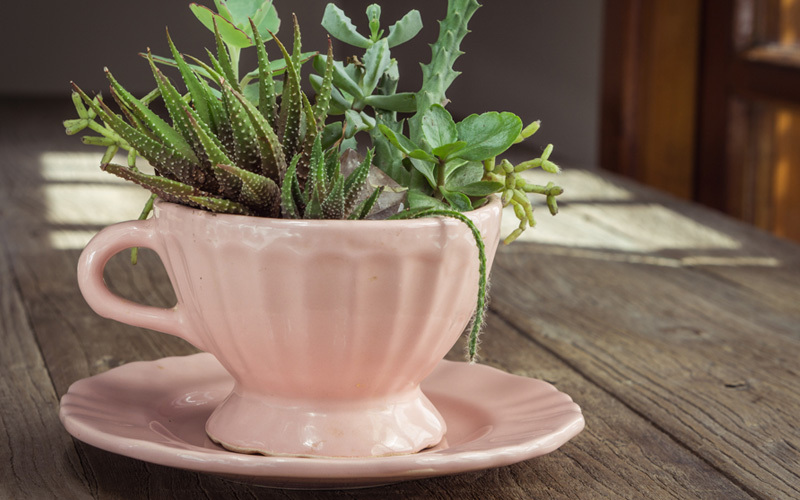 This tiny pink teacup contains sturdy succulents. The graceful fluted form of the cup and saucer sets off the chubby leaves of the plants for an overall look that’s charmingly off-beat. 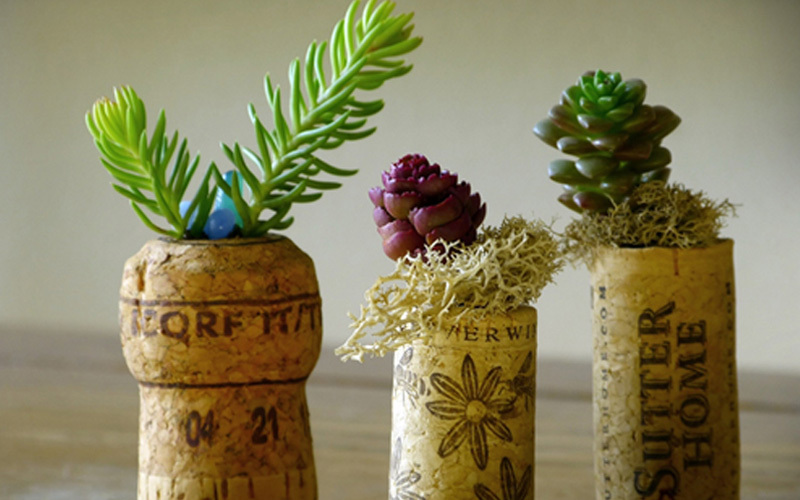 Cutting holes into wine bottle corks creates miniature rooting pots for tiny twigs and shavings of lichen. The organic colors of the corks make them look like little tree trunks, and the display would be perfect for a Christmas decoration. Marine blue inside with lively blue stripes around the outside, this container may once have had other uses, but it has come to rest in the garden as a place to grow profusions of yellow and blue pansies as it gently wears away. 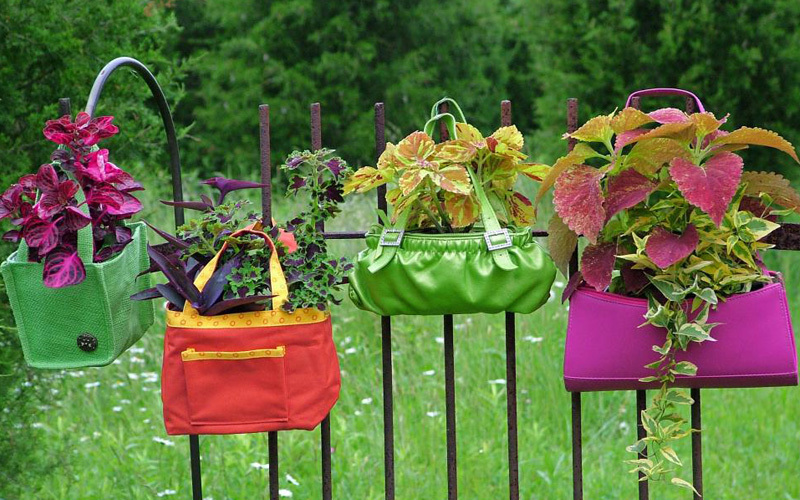 Shiny handbags and candy-colored lunch coolers hang from a metal fence. 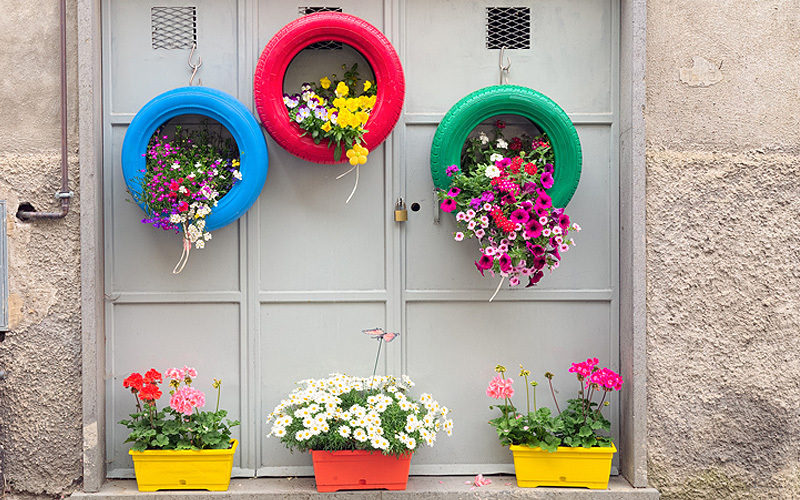 The bright green, purple, orange and yellow bags are colorful homes for plants, trailing and upright. Purple coleus leaves are especially striking in this bold display. 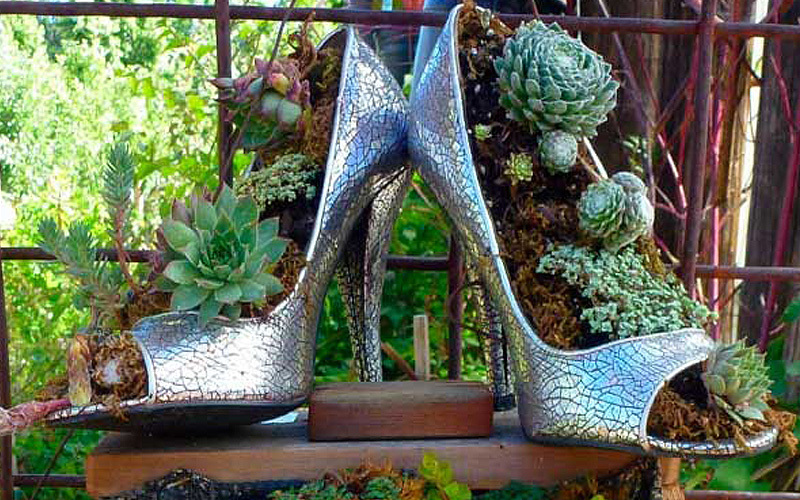 They may not be dancing in the breeze, but these hearty succulents are growing happily in a recycled pair of pumps. Still sparkly and crazed with a lacy pattern, the high heels may have seen better days, but I doubt it.